The U.S. Environmental Protection Agency (U.S. EPA), Region 10, recently reached a settlement with Emerald Services, Inc., a hazardous waste storage and treatment facility in Tacoma, Washington, over violations of the Resource Conservation and Recovery Act (RCRA) and violations of the facility’s RCRA permit. 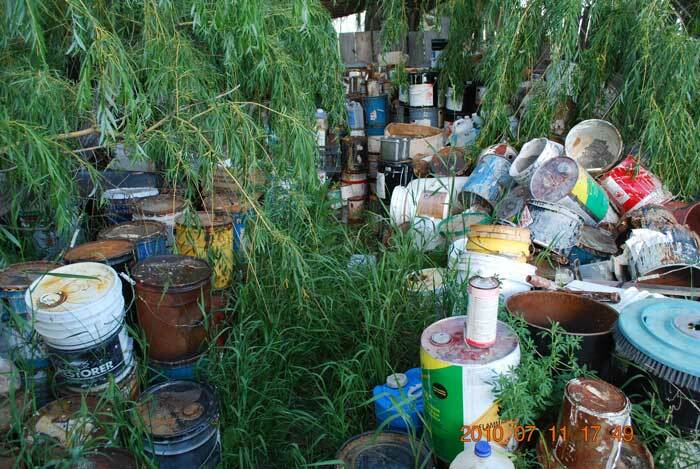 This enforcement action was coordinated with the Washington Department of Ecology. The facility is located within the boundaries of the Puyallup Tribe’s reservation. Emerald Services manages large volumes of hazardous waste, solvents, and antifreeze and re-refines used oil at the Tacoma facility. Emerald was purchased by Safety-Kleen Systems, Inc. on July 8, 2016, and both Emerald and Safety-Kleen are owned by parent holding company, Clean Harbors, Inc. Ensuring that funds will be available if the company’s operations harm people or damage property is an essential element of the “cradle to grave” RCRA hazardous waste management program. Emerald Services Inc. Facility, Washington State, U.S.A. This settlement resolves several RCRA violations at the Tacoma-area facility. Specifically, the company failed to maintain adequate third-party liability insurance coverage of the facility for the past six years. As part of the settlement, Emerald Services agreed to pay a $125,800 penalty and amended its current insurance policy to comply with its RCRA permit. There is a history of spills and incidents at Emerald’s Tacoma facility. In 2013, a 1,900-gallon spill of a highly dangerous fuel oil/asphalt mixture injured a worker. Emerald’s pattern of spills and releases suggests the facility may have a higher probability of future accidents, underscoring the need to have liability coverage for possible bodily injury, property damage and environmental restoration. Violating environmental laws puts public health and the environment at risk. EPA protects communities by ensuring compliance with federal environmental laws. By fairly enforcing environmental laws, we level the playing field by deterring violators and denying companies an unfair business advantage over facilities and businesses that follow the rules. CHAR Technologies Ltd. (“CHAR“) (TSX VENTURE:YES) recently announced that it has signed a non-binding letter of intent (“LOI“) to acquire the Altech Group (“Altech“), which is comprised of Altech Environmental Consulting Ltd. and Altech Technologies Systems Inc. Altech provides solutions to environmental engineering challenges. Founded in 1986, Altech has 12 employees and a diverse and stable client base. Under the terms of the LOI, CHAR would acquire all issued equity in Altech. Altech shareholders would receive $950,000 in common shares of CHAR, with the number of common shares anticipated to be determined using the 30-day volume weighted average price of the CHAR common shares prior to November 17th, 2017, as well as $150,000 in cash. In connection with closing, CHAR will institute an employee retention plan where current non-shareholder Altech employees will be issued an aggregate of $100,000 of common shares (the “Equity Grant“) at a price determined in accordance with the policies of the TSXV over a period of 13 months with any unvested grants to terminate should the relevant employee cease to be employed by Altech. Closing is anticipated to take place on or before December 31, 2017. CHAR brings the shareholders of Altech a succession plan and an opportunity to realize value at an optimal time. According to Alexander Keen, Founder and CEO of Altech, “CHAR would bring an exciting new technology and a corporate development team. Our joint efforts going forward would bring tremendous opportunities”. The completion of CHAR’s acquisition of Altech is subject to the satisfaction of various conditions, including the negotiation of a definitive agreement and the completion of the parties respective due diligence. Although CHAR anticipates that the transaction with Altech will be consummated, the LOI is non-binding and there is no certainty that the transaction will be consummated. CHAR is also launching a non-brokered private placement of common shares that will raise capital to support the continued commercialization of SulfaCHAR as well as CleanFyre. The offering will consist of a minimum of $250,000 and a maximum of $1,000,000. Pricing will be $0.21 per common share or, $0.25 per share for investors who wish to acquire flow-through common shares pursuant to the offering. The private placement is anticipated to close on or about December 31st, 2017. CHAR is in the business of producing a proprietary activated charcoal like material (“SulfaCHAR“), which can be used to removed hydrogen sulfide from various gas streams (focusing on methane-rich and odorous air). The SulfaCHAR, once used for the gas cleaning application, has further use as a sulfur-enriched biochar for agricultural purposes (saleable soil amendment product). When Is a Discharge to Groundwater Subject to the U.S. Clean Water Act? Can You Say “Significant Nexus”? Chief Judge Waverly Crenshaw recently addressed the issue in Tennessee Clean Water Network v. TVA. Judge Crenshaw’s solution was creative – meaning he pretty much made up out of whole cloth. That doesn’t necessarily mean that it’s wrong, however. 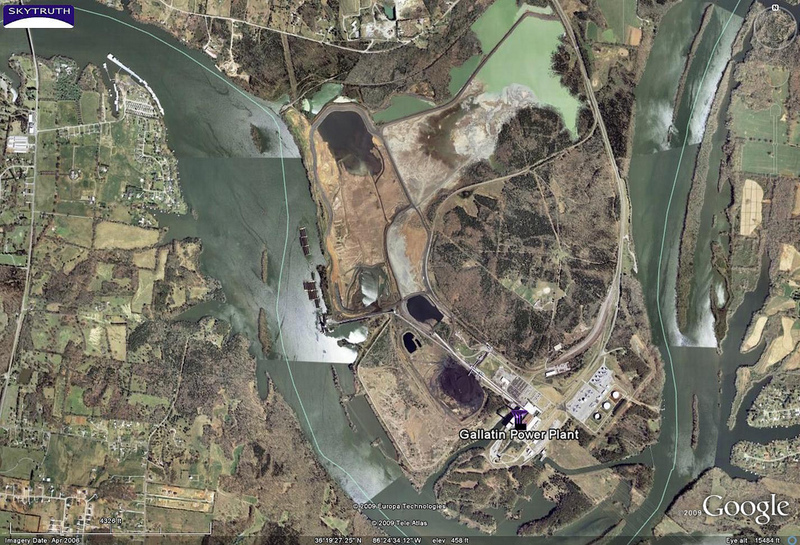 The case involves coal ash management at the TVA’s Gallatin plant. Some of the – unlined – ponds directly abut the Cumberland River. The plaintiff citizen groups brought claims under the CWA, alleging that TVA was discharging pollutants to the River – via groundwater – without an NPDES permit. They requested an injunction requiring that the TVA remove the coal ash from the ponds, at a cost of $2 billion. Gallatin power plant, operated by the Tennessee Valley Authority in mid-Tennessee on the north bank of the Cumberland River. Location of the main coal-burning facility is indicated by the icon and label. Judge Crenshaw was clearly frustrated by an absolutist position on either side. Clearly, he does not think that any link between groundwater and surface water, no matter how attenuated, can be enough for jurisdiction to attach. On the other hand, he was also trying to reckon with the specific case in front of him. As he saw it, the Gallatin ash ponds were a complete environmental mess. They immediately abut the Cumberland River, clearly a water of the United States. Can the outcome really be different if the ponds discharge directly to the River than if they discharge to groundwater 10 feet from the River, where that groundwater then discharges to the river? the Court concludes that a cause of action based on an unauthorized point source discharge may be brought under the CWA based on discharges through groundwater, if the hydrologic connection between the source of the pollutants and navigable waters is direct, immediate, and can generally be traced. I confess I like this solution, because it is practical and will generally yield reasonable results. It avoids either effectively regulating all groundwater under the CWA or having to conclude that the CWA can’t reach situations such as the Gallatin ash ponds. We all know how well that’s worked out. This article was first published in Law and the Environment, a blog from Foley Hoag LLP. http://hazmatmag.com/wp-content/uploads/2017/11/Gallatin-Power-Plant.jpg 698 1024 hazzmatt1 http://hazmatmag.com/wp-content/uploads/2017/01/hazmat-logo.jpg hazzmatt12017-11-14 13:02:242017-11-14 13:02:24When Is a Discharge to Groundwater Subject to the U.S. Clean Water Act? Can You Say “Significant Nexus”? As reported in the Vancouver Sun, The owner of a Shawnigan Lake quarry that was used as a landfill for contaminated soil is suing the provincial government and the former minister who ordered it shut down. Cobble Hill Holdings Ltd. recently filed suit in B.C. Supreme Court against the Province of British Columbia and Mary Polak, who was the B.C. Liberal environment minister and is still the MLA for Langley. No statement of defence has been filed, either by Polak or the province. In February 2017, while still environment minister, Polak cancelled the permit that allowed Cobble Hill Holdings to receive and store contaminated soil at its former rock quarry upstream of Shawnigan Lake. Polak said the company had failed to meet a government deadline for an irrevocable letter of credit that would serve as a financial security. In its suit, Cobble Hill Holdings says the government had not specified any form or amount for that credit, and had not approved the plans that would have been the basis of the financial guarantee. The company’s operating permit, issued in 2013, had been suspended in January when the Environment Ministry asked for the financial security as well as a closure plan, including a cost estimate, and water management review reports. Cobble Hill Holdings said it submitted updated plans to the ministry for approval on Feb. 20. Three days later, its permit was cancelled. As a result, the suit says, the land is contaminated and Cobble Hill Holdings has suffered financial damages. Cobble Hill Holdings had decided to lease the lands to South Island Resource Management and notified the ministry that that company would be the primary operator of the permit, the suit says. Cancellation of the permit resulted in the termination of the lease, which had required South Island Resource Management to pay Cobble Hill Holdings $50,000 a month. The permit issued in 2013 allowed Cobble Hill Holdings to receive and store up to 100,000 tonnes of contaminated soil a year at its quarry. It was upheld by the Environmental Appeal Board in 2015, but faced multiple court challenges before it was cancelled in February. Much of the contaminated soil was from construction sites in Greater Victoria. Shawnigan Lake residents expressed concern about contaminants leaching into their water supply, and packed open houses to voice opposition. Demonstrators at the landfill were arrested for blocking trucks delivering the soil. They also went to the legislature to complain to the government. Polak said repeatedly that the issue was a matter between the company, Environment Ministry technicians and the courts. When the permit was cancelled in February, the government stressed the decision had nothing to do with any pollution detected or any legal issue being contended. “To be clear, the permit was not cancelled due to pollution occurring, nor was it directly related to anything before the courts,” the Environment Ministry said in a statement. As reported in Nunatsiaq Online, an old Iqaluit dumpsite littered with metal refuse, fuel barrels and other toxic waste overlooking the Sylvia Grinnell River will soon be removed, following a multi-million dollar remediation contract recently issued by the federal government. Iqaluit is the capital city of the Canadian territory of Nunavut. It sits on vast Baffin Island in Frobisher Bay, in Canada’s far north. Transport Canada has confirmed that it awarded over $5.4 million to Kudlik Construction Ltd. for cleanup of the dump,which lies along the mouth of Sylvia Grinnell River—a popular source of fish. The contract follows recommendations outlined in a 2016 report by Arcadis Canada Inc., commissioned by Transport Canada, that detected the hazardous debris buried in the area and noted in earlier studies dating to 2001. “The nature of the debris in the main landfill and scrap metal dump suggest that the [United States Air Force] was likely responsible for depositing a large portion of the wastes currently found on the site,” said the report, which estimated the dump was started around 1963. That’s when the Frobisher Bay airbase and weather station was sold to Canada by the U.S. military, but not before American personnel bulldozed old cars, appliances, fuel containers and other toxic refuse over a cliff near the river, the report said. The site was used intermittently until the 1970s, when it was abandoned for another landfill near Apex. The area is still used today as a “rogue dumping site” by local residents, the study said, and that could be another source of contaminants. Along with the remains of vintage army vehicles and cars, appliances and modern waste, like car batteries. Surveyors identified toxic petroleum hydrocarbons, polychlorinated biphenyls, or PCBs, pesticides, and other hazardous materials at four zones within the dumpsite, extending from higher ground to within a few metres of the river. Work will begin at the site in the coming weeks and will continue until October, Transport Canada said. The remaining non-toxic waste will be sealed into a new landfill and monitored closely until 2020. “It’s great news that the Sylvia Grinnell area is being remediated,” Iqaluit Mayor Madeleine Redfern told Nunatsiaq News July 25. But she said other old dump sites grounds surrounding the city remain unaddressed despite concerning signs of contamination. The question is: who is responsible for cleaning them up? Since many of the contaminated sites predate Iqaluit’s incorporation as a municipality, the responsibility for their remediation—such as the old metal dump—can be hotly contested. Transport Canada said its responsibilities to remediate land in Iqaluit extend to areas like the Sylvia Grinnell dump, as part of an agreement to cleanup lands around the airfield that were transferred to the Government of Nunavut in the 1990s. But in submissions to the Nunavut Planning Commission for its upcoming draft Nunavut Land Use Plan, the City of Iqaluit identified eight contaminated sites in and around the municipality that don’t fall under the airfield agreement. Those include areas that have yet to be remediated in West 40, Federal Road, Apex, Upper Base and Lower Base. Redfern said various reports on contamination around Iqaluit often never find their way to the right departments, leading to confusion or inaction between municipal, territorial and federal governments on the implementation of their recommendations. And costs associated with remediation fall well outside the financial abilities of Nunavut municipalities. “The local level governments have never had the money to effectively be able to handle environmental remediation within their communities,” Redfern said, adding that in her two terms as mayor she’s approached federal and territorial governments about “half a dozen times” on the issue. A report commissioned in 1995 at the site of the old Apex dump found elevated—but below hazardous—levels of lead, copper, zinc and PCBs in nearby soil and marine sediment on the nearby shoreline. Redfern said the possibility of leaking contaminants from the dump could effect the quality of clams in the bay, but governments not addressed the issue. And the city’s closed North 40 metal dump—northwest of downtown Iqaluit—also dates to the era of the U.S. air base, and shows signs the site may be leaking. Another study by researchers from the University of Saskatchewan published in 2010 noted elevated levels of hydrocarbons in Iqaluit’s Lower Base area, but concluded the levels are too low to be of risk to human health. Lower Base used to be a dumping ground for spent fuel canisters, dating back to the earliest period of the U.S. air base in the 1940s. Redfern added that a study estimated costs to remediate toxins discovered in the last of of the old Butler buildings in Lower Base, one of the oldest structures in Iqaluit, at more than $1 million. Modern Iqaluit, or Frobisher Bay, was founded when the U.S. military constructed the Iqaluit airfield during World War II, as a rest point for planes flying to Europe on the Crimson Route. During the Cold War, Frobisher Bay became a central relay point for construction of DEW line stations across Canada’s North, which were built to detect bombers from the Soviet Union crossing into North America through the Arctic. After the DEW line was replaced by the North Warning System, starting in the late 1980s, many of those stations were abandoned in the early 1990s, leaving behind heaps of toxic waste and contaminants. In 1996, the Department of National Defence began remediation of 21 DEW line sites across the Arctic at a cost estimated at over $575 million in 2014. 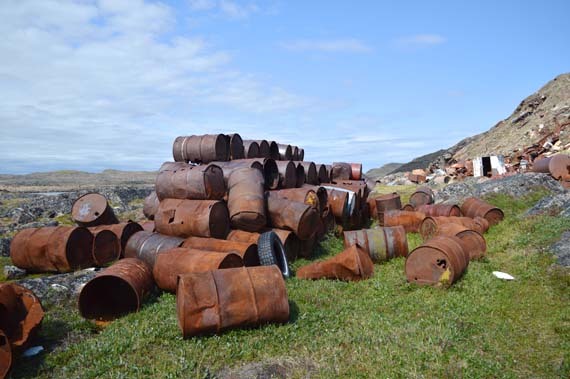 Despite being surrounded by many of the same hydrocarbon and PCB contamination garbage leftover from military uses, only a few hazardous sites near Iqaluit—like Upper Base and Resolution Island—were marked for cleanup as part of that project. “While remediation [of Resolution Island] provided benefits to the community of Iqaluit, primarily through contracts and employment, the community of Iqaluit has not received the same level of special designation or status for remediation clean up,” the City of Iqaluit said in its submissions to the Draft Nunavut Land Use Plan.